This great family retreat sits on two private lots (one vacant) on the Gravois Arm (4-mile marker) and has a panoramic view of the channel. 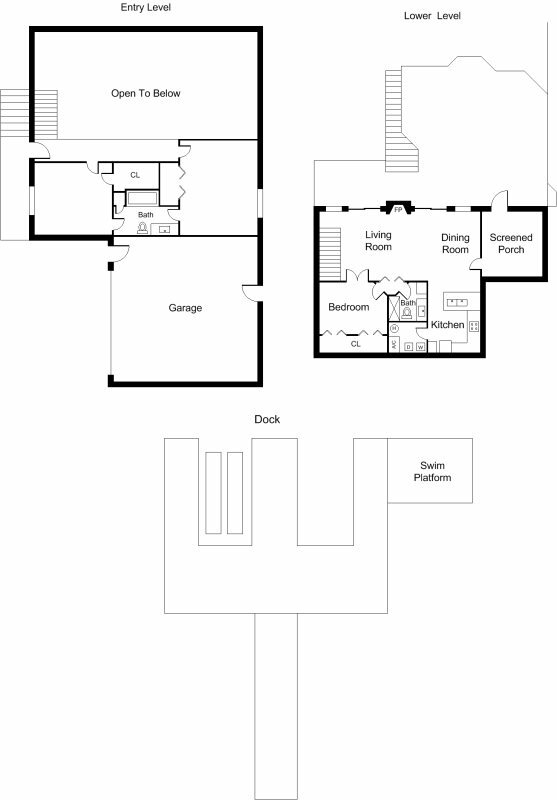 The home has an open floor plan with three bedrooms, and two baths. Guest enter the home on the second or upper level and it's open balcony overlooks the main living area below. Upstairs off the balcony are two bedrooms. One is a queen size bed with a large walk-in closet. The second bedroom contains two full size beds. Both bedrooms share a hollywood bathroom with a shower tub. The downstairs is set up with an large open floor plan and includes a living room with a beautiful gas log fireplace, dining room, kitchen with breakfast bar and laundry room. Directly off the living room is the master bedroom with a queen size bed and access to a full size shower bath. Guest have access to several exterior features of the home. Enjoy relaxing in the outdoor living area within the large sunroom or relax on the massive 1,000 sq foot deck that is accessible from the lower level. The deck is furnished with a complete patio set that includes outdoor dining, several lounge chairs, and a large gas grill. Nature lovers and children will enjoy observing and exploring the adjacent lake front vacant lot that is filled with wildlife (birds, fox and occassionally deer). Water lovers will enjoy having access to a large two well dock with an attached swim deck and ladder. The boat slip can be rented by guests for $10.00 per day. This 1,900 sq. ft. vacation rental is available year around and has several desirable features. They include central heating/air, dish network TV, VCR, phone, ceiling fans, all bedding, dish towels and iron. The kitchen is fully equipped and includes a dishwasher, range, microwave, side by side refrigerator, and ice maker. Other inclusions are weekly trash service, plenty of open parking, and access to the home's laundry room. Guests staying in this home will enjoy a panaramic view of the Lake, wonderful sunrises and excellent fishing. 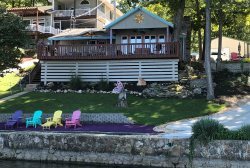 This home is 25-30 minutes away from the attractions on the "busy side" of the Lake - Bagnell Dam, Lake Ozarks and Osage Beach - via the community bridge. Properties are furnished for normal housekeeping with dishes, cookware, flatware, glasses, grills, and basic appliances. We are also pleased to provide bed linens, bath towels, and a starter packet of detergents, bath soaps, trash bags and paper products (toilet paper and paper towels). Guests should bring replacements for these starter packet items, your own beach towels, soaps, personal toiletries, coolers, cleaning supplies, camera, life jackets, etc. Great Family Get-A-Way Home with Panoramic Lake View! Sunrises are Unbelievable. Sip on Your Coffee and Enjoy It's Splendor. A covered boat slip (10'x 24') is available. Rents for $10.00 per day. Mandatory Departure Cleaning Fee $135. Vacation Rental Damage Insurance ($3,000 limit) $49 (default) or sizable refundable security deposit. We loved our stay in this beautiful home and quiet cove. The house was beautifully and comfortably finished. The beds were comfortable and other furnishings were great for lounging and dining together. We loved the deck and screen room. Lots of places to spread out and enjoy time together and separate. We were pleasantly surprised by the beautiful changes in the kitchen, different from the pictures. And it was well equipped. We were able to find what we needed to cook our meals during the week. Just be sure to bring extra toilet paper, we missed that info and had to make a special trip to buy some. Also may want to bring extra dish rags and towels as only one each was provided. But minor things in the whole scheme of things. We loved our stay there and would do it again in a heartbeat! This was our second stay. Love the house and deck. Sherry does a great job and we have enjoyed renting from her for years. The only issue really was the television system. Just a great relaxing visit. We'll probably do it again in the off-season. Thank you for your excellent service and accommodations! We have used crystal waters villas for fifteen years and they have been great. Sherry Shippee and crew have always been super.